The day started out with the trip to the Kathmandu airport and the flight to Lukla. The domestic terminal at Kathmandu airport is separate from the international terminal: much more chaotic. The whole system was very confusing: I could never tell what was going on. 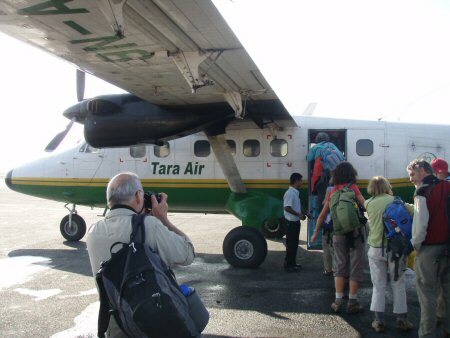 Eventually we were sent out onto the runway to squeeze into a tiny plane, which whisked us off to Lukla. On the way, we passed endless terraced fields, all green and lush looking. The landscape was beautiful. We edged up towards the higher mountains: the roads disappeared but not the farms. Eventually we were flying between great mountains towering above us. The plane headed straight at the side of the mountain, determined to crash into it. All I could see out the windshield was cliffs straight ahead. Then suddenly the plane touched down on a steep runway, climbed to a stop, wheeled around, and let us out. We grabbed our bags and made our way off the runway as another group of people was climbing aboard: the plane was gone again in minutes. As we stood around dazed, trying to get our bearings, our sherpas showed up, grabbed our bags, and carried them up the hill to the grounds of the Himalaya Lodge. The first thing: they serves us tea and crackers. Every piece of equipment, including all our food, had been carried by our porters from Jiri, six days walk. 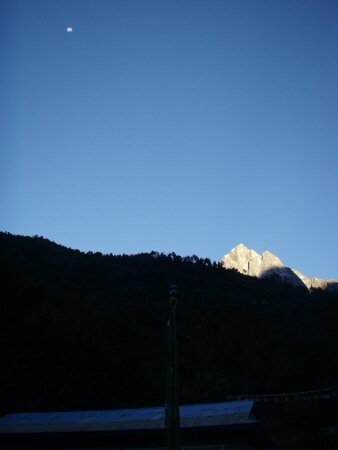 Everything came together on schedule that morning at Lukla. 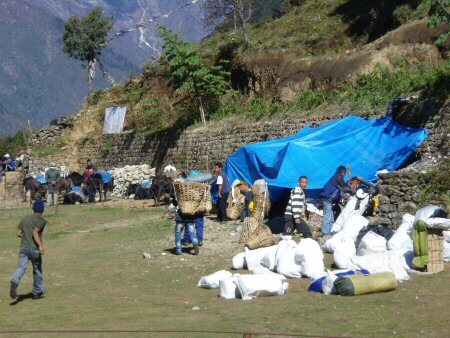 Our baggage, food, and tents were distributed among the porters, and we all headed up the trail. 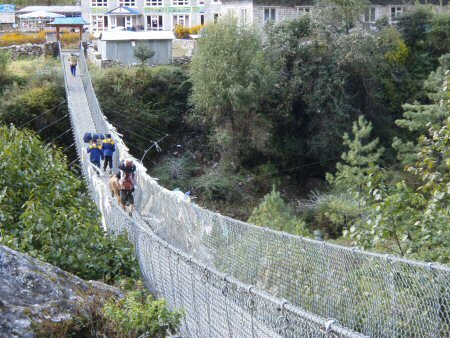 Or rather down, as the trail descended from Lukla about 1000 feet to the bottom of the canyon. We passed many trekkers going the other way, returning to Lukla on their last day. Each one we spoke to had a great trip, thought it was well worth it, and was glad to be getting back home. 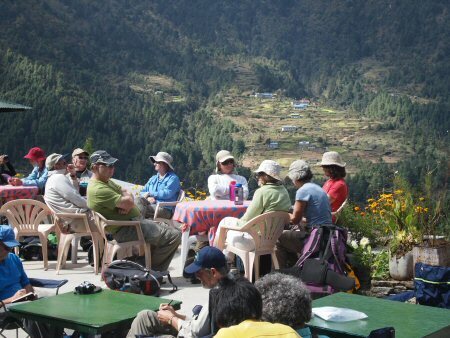 We stopped for lunch in Cheplung, below Lukla but still way above the bottom of the canyon. We sat on the terrace of a guest house, where our own staff cooked and fed us. It was pleasant to bask in the sun, watch a steady stream of porters and yaks pass by, and enjoy our first meal. At this point everything was so new: the Mani Stones, the numerous shrines and guest houses, the continuous series of villages, farms, other civilization, finding a public toilet. It was sensory overload. After lunch we descended more, all the way down to the river (Dudh Koshi). At this altitude (9000 feet) the fields seemed lush and green. The potato harvest was complete, so many of the fields were recently dug up. Many other vegetables were still in the ground: cabbage, cauliflower, turnips, carrots, onions, even some corn with beans growing up the stalks. People were gathering up the plant residue -- it provided rich fodder to the yaks at higher elevations, where they could not graze on their own. And many people are shelling beans, after drying them out. We were hiking uphill now, following the rise in the river bottom. After crossing the first of the bridges across the Dudh Koshi, we turned in to a campsite in Phakding. In retrospect, this first campsite was typified all the others. It looked like the campsite doubled as a yak pasture and was adjacent to a guest lodge. We did not go inside the lodge, but the outside lights from from it stayed on all night. Combined with a full moon, the night didn't ever get really dark. I found the sleeping pads that were provided for us to be very comfortable: warm and soft. I never unpacked my own Thermarest. If possible, I would have sent it back right then. Even though we are deep in the canyon, and the sun goes behind the mountains early in the afternoons, the snow covered peaks are still visible high, high above. Long after it is turning dark down below, the sun is still brilliant high above. It is hard to believe that we will be climbing up that high, and will be up among the snowy peaks in a week or so.